Our Liechtenstein Tiara Championship has twelve entries, which we have drawn into to groups of six each. All the tiaras in group A will face off against each other, as will the tiaras in group B. The two tiaras with the most wins of each group will advance to the next round, the semifinal. In the semis, the winner of group A will face the runner-up of group B and vice versa. If two tiaras have the same amount of wins, we'll see how they fared head-to-head. 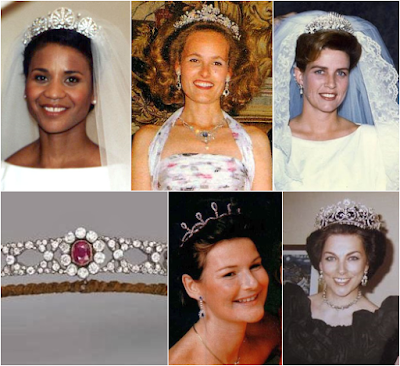 Not all tiaras involved are strictly owned by the Princely Family but has been worn by one of their princesses. We did exclude the Luxembourg tiaras Princess Margaretha has worn as we've already covered those last year. Favorite: I have to go with the Habsburg Fringe, which happens to be one of my favorite tiaras full-stop. It's so perfectly proportioned and classic, and I love that it has such a detailed historical legacy. Dark Horse: Hereditary Princess Sophie wore the Douglas Tiara so beautifully at her wedding that I think it might sneak out a win in this group. Everybody loves a diamond floral tiara, right? Which Will Advance? : Still going with the Habsburg Fringe. Favorite: The Kinsky Tiara is beautifully balanced, and I think the combination of the rounded elements and the upright pieces works so well. It was gorgeous on Princess Angela at her wedding! Least Liked: Princess Margaretha's Sapphire Necklace Tiara doesn't do it for me. Too spindly! Dark Horse: The Boucheron-made tiara from the Greek royal family is not one of my personal favorites -- it's a little too tall for my liking -- but it is a design triumph in many ways, and I think many will be rightfully impressed by it. Which Will Advance? 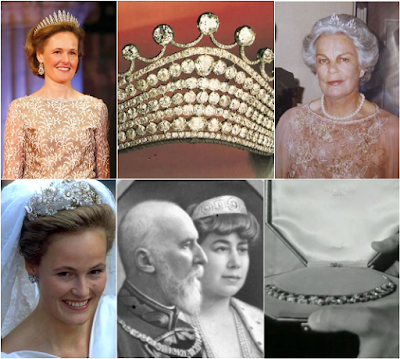 : Either the Kinsky Tiara or the lovely pearl and diamond floral tiara worn by Sophie. Ooh, this is tough. So many good choices! I'm going with the Habsburg Fringe -- it has classic style and an imperial legacy, and it's still in the royal spotlight at major events today. Which one do you think will get the crown? Leave us a comment below and make sure to return tomorrow to cast your first vote!